This month I was asked to look at two tools from Thompson Lathe Tools, which were the CPM 15V 12mm (1/2in) 'V' bowl gouge and the new 20mm (3/4in) Deep Bottom Gouge. Both tools are made from powdered tool technology and are cryogenically hardened. This process allows steel to be hardened without becoming brittle. Cryogenics involves exposing the metal to a very low temperature and this is applied between the first and second temper which results in changing the crystalline structure of the metal to produce a unique grade of steel capable of holding its cutting edge for a prolonged period. This negates the need to sharpen the tool frequently. The tools themselves have a gunmetal appearance and are polished rather than the shiny norm. 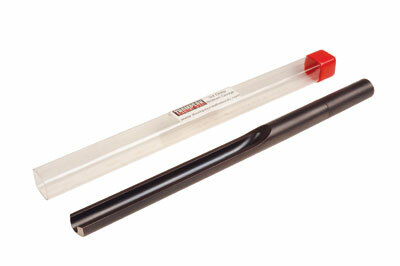 They are supplied in a plastic tube which is also very handy to store them in when not in use. 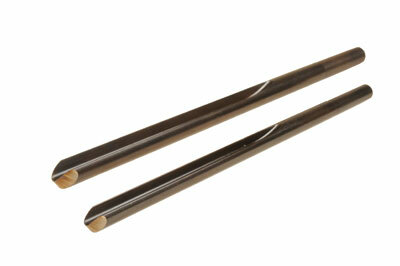 The tools are supplied without handles but the shanks will fit any standard handle. It must be remembered that the sizing of tools is different from the UK and a 12mm (1/2in) gouge means it is manufactured from 12mm (1/2in) diameter bar; this does not relate to the measurement between the flute. 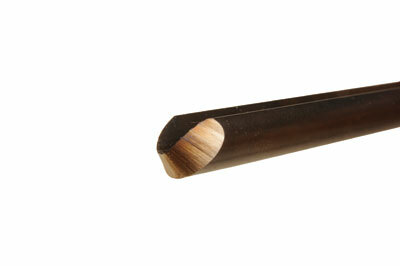 Both tools are well balanced, very robust and slide cleanly over the toolrest. I have been testing the 12mm (1/2in) Bowl Gouge on various woods - soft to hard - and it does what it says, although I have yet to sharpen it. It comes with a pre-ground 60° fingernail grind which only requires a slight touch up and polish. For those who do not like sharpening, it could be used as bought. The overall length of the tool is 255mm (10in) and the flute measures 150mm (6in) with a reduced polished ground shank of 50mm (2in) to accept the handle. This tool has an overall length of 305mm (12in) with a diameter of 20mm (3/4in) and the same slightly reduced diameter to accept a handle. The grind on this cutting edge is 80° and could be considered a flat grind as the wings have not been ground down - yes, this is a scraper grind. It has a heavy substantial blade and like the 12mm (1/2in) bowl gouge, there is no possibility of flex even with the heaviest cut and it extends well over the toolrest. With tools of this diameter, the old adage of the 'ABC' of turning should be remembered: 'A' for anchor, 'B' for blade, and 'C' for cut. I took a nice alder (Alnus glutinosa) blank measuring 280mm (11in) diameter x 50mm (2in) thick and this looked to me like a piece for a final project - a flat bottomed bowl - with a slightly curving concave internal side, and flat rim. My intention was to only use these two tools on the tests other than cutting the recess - base - to accept my chuck jaws. Having marked out the centres, I fitted a faceplate and mounted the piece onto the headstock of my faithful Record Nova having first swung the headstock out at 45°. 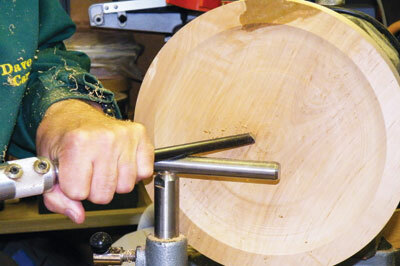 I then proceeded to rough out the blank with the 12mm (1/2in) Bowl Gouge, both faces and edge, at a speed of 1,000rpm. The tool cut like butter using both push and draw cuts. A dovetail recess was then cut into the face that was to be the base and the base was completely shaped and finished only using the gouge. Finishing cuts were completed by feathering the gouge across the workpiece producing what I call 'angel hair' and dust. This produced a finish that was as good as any skew chisel. The tool handled impeccably and did everything I wanted it to do, the cutting edge not showing any signs of bluntness. All that was now required was a quick sand, and finish. I then removed the workpiece and faceplate, reversed it and fitted it onto my chuck. Again using the gouge, I shaped the inside of the bowl using all four methods of cutting â€“ push, pull, left face then right face of the cutting edge. As before, the tool did what I wanted it to very quickly, taking deep and shallow cuts and it also produced a good finish. I am not an avid fan of scrapers so I had reservations about this tool. Having polished the cutting edge to my satisfaction and using a push cut, I started from the side wall towards the centre. I took a minimal cut and it worked, producing a good, clean finishing cut. I experimented with a heavier cut - again, excellent results followed by a finished feathering cut. It must be said that it's a heavy tool and the cutting edge must be presented to the workpiece at the correct angle or a rub rather than a cut results. The ability of the tool to sweep from the side wall to the bottom was unexpected, but worked, and produced a nice transition without any cutting marks. I would have preferred a smaller gouge, say 12mm (1/2in), but again that is my preference and tools are bought to suit what you want. Having said that it does what it says on the packet. In my opinion, both tools are reasonably priced. You do get what you pay for. The old saying 'buy cheap, buy twice' should always be remembered. The 12mm (1/2in) Bowl Gouge retails for $75 (about Â£46.50) and this doesn't include shipping and taxes. Now this to me is good value without the addition of postage and extra charges. The 20mm (3/4in) Deep Bottom Gouge retails at $105 (about Â£64.40), but again you have to take into account the extra shipping costs involved. What you should do, and it's only my opinion, is to buy what you can afford. For me, both tools offer excellent quality and a long lasting cutting edge. If you spend more time than you should in your workshop and take pride in your work, then these are the tools to consider buying. They will last a very, very long time. I have had the pleasure of using various Thompson Tools over the last few years and I have to say that I have never had a problem with any of them. So, it should come as no surprise that I didn't have any problem with these, either. The CPM 15V Bowl Gouge perfomed well and did hold its edge for a very long time on many materials I worked with. It can be honed to a very fine edge and I like the flute profile which allows the turner to create various types of grind on the tool with ease. 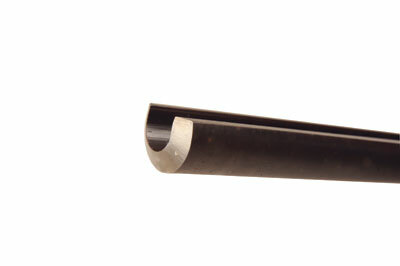 The flute profile of the Deep Bottom Gouge is, at first glance, not dissimilar to that of a milled spindle roughing gouge. It is ground square across, and was very easy to use on that bottom section of the bowl. Being ground square across it cannot be used to enter into the wood for the initial cuts; the wings would touch the wood prior to the required part of the blade cutting. The mass of the blade minimises vibration due to the overhang of the blade over the toolrest. The profile allows you to rotate the blade easily to achieve the optimum cut.